At my house, we take off our shoes. I live with two roommates and the no shoes rule was in place when I moved in so I have abided ever since. We have a little area by the front door where we kick off our shoes and we go bare- or stocking-footed around the house most of the time. Sometimes I accidentally wear my cycling cleats around for an extra few minutes; my logic is that the metal cleats are the only part that touches the ground so really, they’re not that bad. EXCEPT REALLY, THEY ARE. REALLY, WE ALL NEED TO BE REMOVING OUR SHOES WHEN WE GO INTO OUR HOUSES. In Asian and European cultures it’s commonplace; in David Sedaris’ wonderful story “The Smoking Section” about moving to Tokyo to quit smoking he is admonished to remove his shoes even though it’s his apartment. There’s even a small shoe tree filled with pairs of slippers in various sizes so that he may traverse his apartment with feet covered by something that, presumably, hasn’t been treading the streets of Tokyo. But shoe-removal at the front door never really caught on in America. It really should, though. First of all, shoes are covered in the detritus of daily trudging around the streets. Gum, cigarette butts, parts of other things that have been in people’s mouths, rotting food, moldering leaves, mildew, just good old-fashioned dirt covers the soles of our shoes all the time. Why would we want to bring all that junk into our lives? 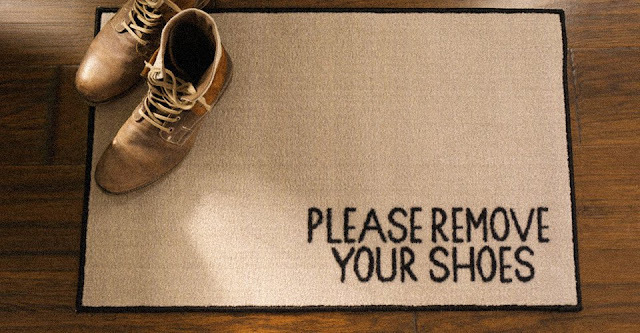 Scientifically, however, it’s really not a good idea to bring our shoes any further inside our homes than absolutely necessary, and that’s because of a little bacteria called clostridium difficile, or “c diff”. C diff is notoriously antibiotic-resistant (hospitals have massive procedures involving cleaning and sanitizing rooms containing patients with C diff) and research by the University of Houston found that up to 40% of shoes entering the home are contaminated with C diff bacteria. Furthermore, some other rather unfriendly pathogenic bacteria like e.coli and klebsiella pneumoniaeroutinely hitch a ride into our homes on our shoes. And finally, it causes serious wear and tear to your flooring to wear shoes around inside. More dirt inside means more dirt to have to take outside, so why increase not only the wear and tear on your floors but additionally the amount of cleaning you’re going to have to take on to keep your floors ship-shape?